ARLINGTON, Va. (CNS) — The fourth time proved to be the charm for a Catholic school project to send a satellite to space. After three scrubbed launches, a CubeSat built by students at St. Thomas More Cathedral School in the Diocese of Arlington was finally launched into space Dec. 6, headed to the International Space Station. Astronauts at the station will deploy the satellite — a 4-cubic-inch package that weighs less than 3 pounds and is packed with a payload of scientific experiments — into orbit in late January. On Dec. 3, hundreds of St. Thomas More students, parents and teachers filled a conference room at the Boeing Building in the Crystal City section of Arlington County to watch the launch on large TV monitors hanging on the walls. The screens showed the United Launch Alliance V 401 rocket ready to go, and students and parents were excited. “It’s good for the school. It’s a once in a lifetime thing,” said parent Michelle Potter told the Arlington Catholic Herald, the diocesan newspaper. But there was a problem — a problem not uncommon for launches. Liftoff was scheduled for 6:03 p.m. local time. But around 5 p.m., there was an announcement that the launch might not happen. Weather, especially strong winds, gave the launch only a 30 percent chance of happening. There was a 30-minute window for any launch to occur, but at 6:25 p.m. the launch was scrubbed. They would try again the next evening. The Dec. 4 launch also was scrubbed because of weather. Ditto the next day’s attempt. Finally, at 4:44 p.m. Dec. 6, the rocket successfully took off from Cape Canaveral, Florida. After first attempt was scrubbed, the children and their parents took the delay in stride. Some students said they were not surprised. Science experiment payloads created by students and launched into space are not uncommon. But those experiments usually are built by university graduate students. According to NASA, this is the first time a U.S. grade school built a CubeSat. The satellite is named St. Thomas More Cathedral School Satellite-1 or STMSat-1. The project began in April 2012, when Joe Pelligrino, the father of a student and a NASA Goddard engineer, saw the St. Thomas More students form the image of the space shuttle in the parking lot of the school when the Discovery shuttle flew piggy-back over Arlington on a modified 747 from Florida to its final home at the Smithsonian’s Steven F. Udvar-Hazy Center in Chantilly. About 400 students had a hand in designing, building, testing and launching the satellite. Every class from pre-K to eighth-grade was involved. Every student had a job with a job description. The main payload component is a small camera that will take a photograph every 30 seconds and transmit the images to earth stations that will be shared by schools around the world. 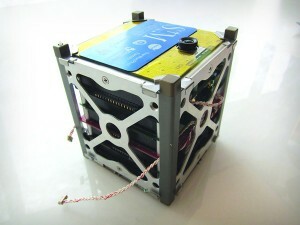 The satellite also will measure temperature in space. NASA provided the school with a special antenna to track the satellite. There were some objects aboard that are not usually included in rocket launches — a Pope Francis medal blessed by the pope and donated by Sister Bernadette McManigal, diocesan superintendent of schools; a crucifix blessed by Father Robert J. Rippy, rector of the Cathedral of St. Thomas More; and a small metal container that holds personal items from a family who made a large donation to the satellite project. Thomas said that the photographs and measurements taken by the St. Thomas More CubeSat will benefit scientists and students around the world. There was another reason for her enthusiasm about the launch. Borowski is on the staff of the Arlington Catholic Herald, newspaper of the Diocese of Arlington.